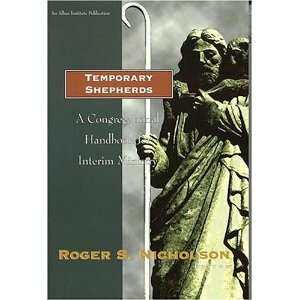 As I continue my reading for a training session I'll be undertaking next month, I'm about halfway through reading Temporary Shepherds: A Congregational Handbook for Interim Ministry. It's a collection of short and related essays on the nature of interim ministry. The work of intentional interim ministers is really important. These are folks who are particularly interested in working with congregations that are in times of transition, and particularly those that have experienced some wrenching leadership changes. I've personally witnessed the positive impacts of a competent interim on several occasions. In the congregation where I grew up, a very capable interim led the process of healing after a brutal and divisive church fight, which involved a pastor leaving with a large portion of the congregation. That interim's work really made a difference. In the congregation where I interned, the pastor died suddenly, and the interim who followed on really helped refocus that church and get them back on their feet. She was a literal Godsend. In congregations where there has been malfeasance, a pastor whose call is re-focusing and redeveloping a communities' identity is absolutely essential. In fact, much of the interim skillset is helpful for anyone involved in the ongoing process of transforming a church. It's one of the primary reasons I'm taking the coursework. The "now you all need therapy before you can move on the to the next stage of your life" approach seems very wise and knowing and professional, albeit a tiny bit too Betazoid. It has the one disadvantage of not actually being true. Sometimes, yes, congregations do need to work out grief or resolve conflict, and need to take their time doing it. But this is hardly the case all of the time. It is decidedly not the case in healthy churches. Having watched as a lay person when a healthy pastoral relationship came to a close, I can tell you straight up that there was no weeping and gnashing of teeth. The pastor simply let us know that he was going to leave in a few months to direct the Presbyterian Church's Ghost Ranch retreat facility. We were, like, dude, that's so, like, awesome! It was clearly a great match for his skills, and though he was really a blessing to the church, and well liked, we all understood. He left as beloved as he had been while among us, with our well wishes for his journey. The interim that followed was a good pastor, but his presence was not necessitated by grief or latent conflict. The congregation was fundamentally healthy, and in healthy relationship with a pastor whose departure was viewed as nothing more than a fact of life. But we still needed to have an interim. Why? Because unlike those who have the noble calling of intentional interim ministry, interim ministry is not something that Presbyterian congregations enter into intentionally. It is mandated. If you're a PC(USA) congregation, you HAVE to have an interim. That's not because Presbyterians are more collectively dysfunctional than, say, our Methodist brethren. Rather, it is because we have no choice. If we don't get an interim, we'll be without a pastor for at least a year, and often longer. Our process for calling a pastor takes too damn long. I use that phrase advisedly, and in context. Let me say it again: the Presbyterian process of calling a pastor takes too damn long. The process is frustrating for churches. It's equally frustrating for pastors seeking calls. It is exhausting, both in terms of the time it requires and the spiritual energies it drains from communities during overlong liminal times. It significantly increases the anxiety in communities of faith that are trying to find new leadership. When even your denominational handbook for entering into the process acknowledges that it is frustrating and draining and intimidating, well, excuse me for going bold and all caps, but PERHAPS THAT'S A SIGN THAT SOMETHING'S WRONG. Well-trained interims do help cushion the impact that this abusively draining and dispiriting process can have on healthy churches. But that they are there shouldn't allow Presbyterians to delude themselves into believing we're going about ministry transitions in the right way. We also shouldn't mask that underlying dysfunction with well-meaning therapeutic assumptions that only enable a critical systemic failure.